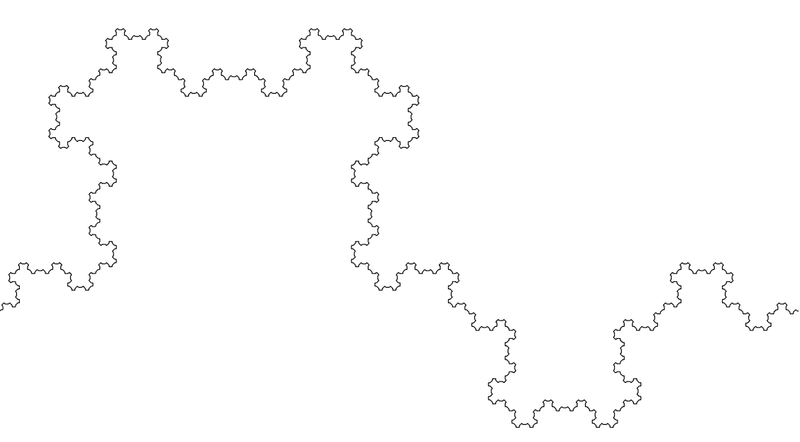 This is a short post about a new type of fractal surface. Simple fractal surfaces are currently rare, which makes finding an example surface for a particular roughness (or fractal dimension) infeasible. 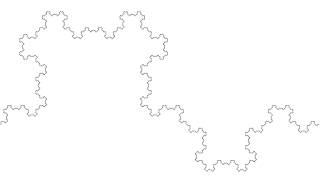 Looking at the simpler case of 2d curves we can quite easily pick a curve for a particular roughness by using a Levy, Koch curve or dragon curve with a chosen bend angle. It would be nice to have an equivalent for a surface. This shows the fractal with heights from -0.25 up to 1.0. From 0 up to around 1.75 the Hausdorff dimension increases from 2 up to infinity. The reason the dimension can exceed 3 is that overlapping surfaces 'overfill' the space; mathematically speak, the set is no longer embedded in 3D space. In fact, as the height increases the fractal 'explodes' out exponentially in size. So it reminds me of a volcano, going from a crater to billowing smoke that covers everything! 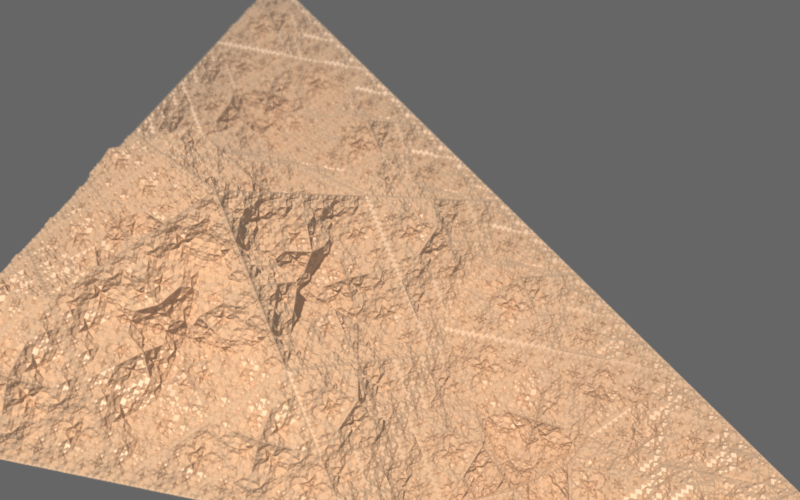 When the height is around 0.55 (4th pic from left) the surface is the roughest it can be without intersecting. This has dimension roughly 2.32. The height of 0.5520923 is interesting for another reason, the triangles are all isosceles at this point (angles 1.1697(*2) and 0.8021). It is tempting to think that this might be the same critical point, but not sure. 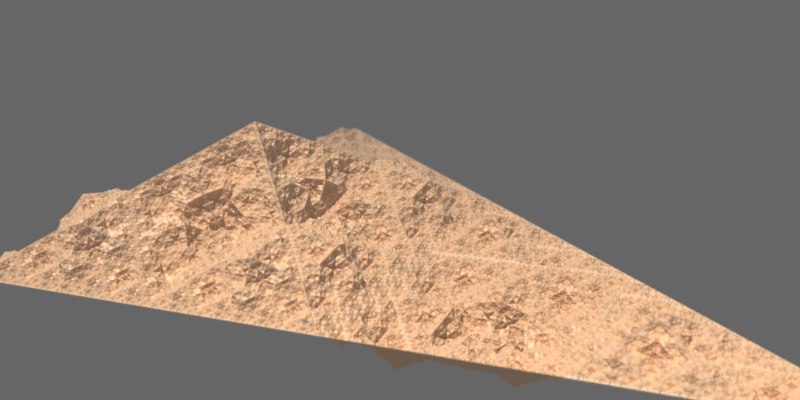 The model file for the 0.55 surface is available as .obj and .aoi here and here. The surface also discussed briefly here and in this article. In this case the largest height before self intersection is about 0.35, as in the picture. 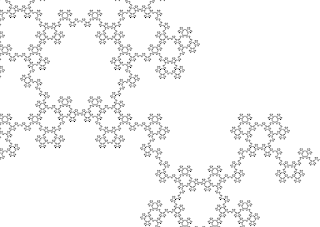 This curve is surprisingly symmetric in its design, and like the Koch curve, you can make a snowflake out of it.